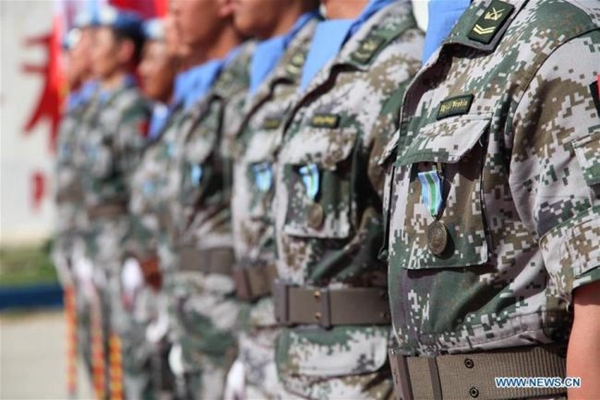 A medal ceremony was held at the Chinese troop's camp in Hanniyah village in southern Lebanon, with the attendance of head of Mission and Force Commander of the UNIFIL Stefano Del Col, Chinese Ambassador to Lebanon Wang Kejian, representatives of the Lebanese armed forces and fellow peacekeepers. Awarding the medal, Major General Del Col said that "the medal you will receive today is a sign of appreciation for your important contribution to the UNIFIL Mission, a precious memory that will stay with you as a reminder of your work in Lebanon." Del Col praised the Chinese peacekeepers for their hard work, bravery and determination, saying "I want to thank all of you for the job you carry out with professionality, commitment and dedication, promoting a culture of peace and proactiveness that well contributes to the implementation of our mandate within the framework of Security Council Resolution 1701." A total of 410 peacekeepers of the 17th Chinese peacekeeping force, which includes a multi-functional engineer detachment, a construction engineer detachment and a medical detachment, have been serving the UN Mission since May 2018. During the past 11 months, the Chinese peacekeepers have swept over 6,690 square meters of minefield and cleared over 1400 AP mines, completed 68 high standard engineering projects, provided physiotherapy and rehabilitation and clinical services to over 8,600 peacekeepers and humanitarian medical assistance to over 3,500 local villagers.